First of all, you will get a vocabulary list as in elementary level. This time is not for intermediate level but for B – TOPIK. 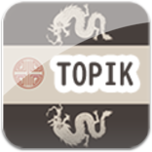 B-TOPIK is a practical Korean language proficiency test. This seems to be an exam for people who work for Korean companies. … but I have never heard of talking about getting a job at a Korean company just because the result of this exam was good. Well, is not it like a bonus test? So why use this B – TOPIK word list? The level of B – TOPIK is about the same as the intermediate level of the Korean language proficiency test. By the way, about 1,000 words are posted in this word list. However, this word list is a painful place where there is no Japanese translation. Next is grammar, it is good to use “S – TOPIK intermediate vocabulary / grammar list” in the page where the B – TOPIK above is posted, but that alone is not enough. It will be the level of Intermediate 2 + α.
Conversely, be sure to grasp all grammatical expressions that come out by Intermediate 2. You do not have to write it. Especially for the TOPIK test, problems of esoteric vocabulary are entered as beginners, intermediate students and higher classes increase in level. Therefore, it is a definite stone to capture a limited grammar first rather than a vocabulary.